How do I create and use Magic Documents? 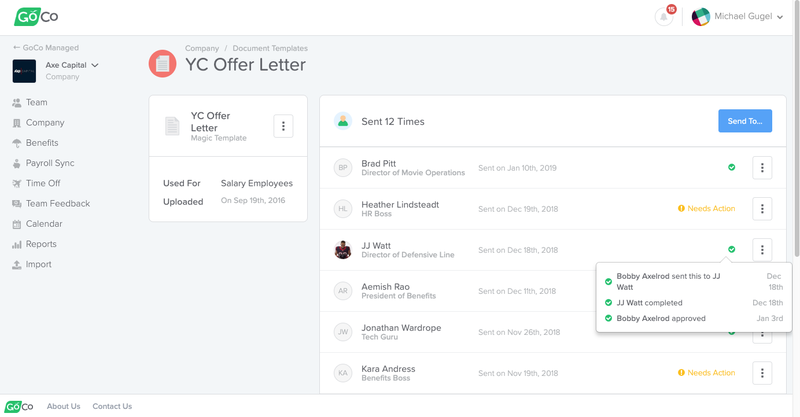 GoCo’s Magic Docs let you digitally sign, complete, and track of all of your company’s HR documents in one place. This will bring you to your Document Templates page. This page lists all of the documents you have in GoCo. Offer Letters & Contractor Agreements - documents that a prospective employee or contractor needs to sign to accept a position with your company. These documents act as a gatekeeper to the onboarding process in GoCo. A prospective employee or contractor will not be able to advance to the onboarding workflow in GoCo without first signing these documents. Performance Reviews - documents that are completed by the manager, employee, or a combination of both. This category is special because you can customize the workflow and send the document to either the employee or manager first. Government Forms - documents such as the W-4, W-9, and I-9. You cannot edit these because they are defaults in GoCo. They also do not count against your magic document total. Agreements, Forms & Handbooks - any other supporting documents you will send to new hires and current employees. Documents to Collect - can be used for just about anything - but are mostly used for uploading certificates, trainings, licenses, etc. This category works a little differently than the rest of the documents experience. Employees are presented with a place to upload a document, instead of them completing a document in GoCo like the above categories. 2. To add a document, simply click + under the desired category, upload your company’s existing documents (PDF or Word), give it a name, answer any prompted questions, and then click save! 3. Build your magic document! Make sure you select the "Fill it out and sign it electronically" option when uploading your document to start building you Magic Doc. You will then be able to start building your Magic Doc instantly by selecting from our list of built in fields or creating your own custom fields. Each Magic Field will automatically fill in the existing GoCo information for each employee. 4. When you’re ready, testing your shiny new template is as easy as switching to the Test tab. You’ll get a live preview of what your managers and employees will see! 5. After confirming that all fields look good, you will Publish the document. 6. After publishing the document templates on GoCo, sending them is as easy as a few clicks. From the Documents page, simply click Send from the actions menu, choose who to send it to, fill in any missing information, and click send! 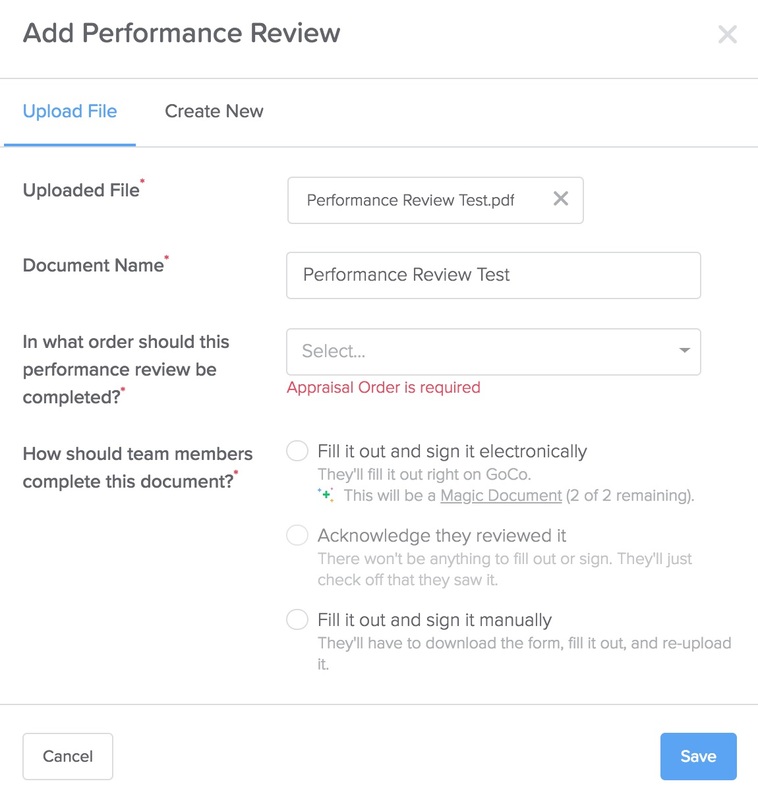 You can choose to send published documents to one employee, all employees, or even make a custom list of people you want to send the document to. The team members you send a Magic Doc to will be asked to review and complete the document. You can even keep track of who has and hasn’t completed the document yet!